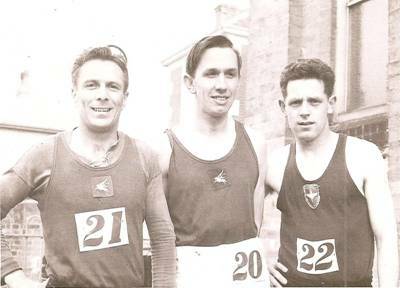 Ian Harris won the SAAA Marathon Championship in 1963 and it came as a surprise to many in the Scottish athletics hierarchy. And yet it shouldn’t have done because he had been a very good athlete for some time and had in fact run for Scotland in the cross country international in 1961. Ian joined Beith Harriers as a Youth (ie Under 17) and his first training run was in a thunderstorm on a dark night. Then on his first race at West Kilbride he tried to jump one of those Ayrshire barbed wire fences when he came off the road and cut himself badly but surprised everybody by coming in first. Beith was a strong club at the time and he was a near contemporary of Tommy Cochrane who won the South West District Cross Country Trophy so often that when the association folded up he was given the trophy to keep. Incidentally his first Senior victory was in 1960, the year before Ian’s first win in the event. 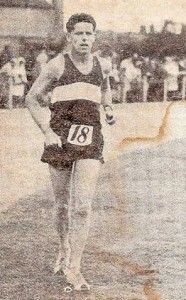 Ian’s career included a victory in the South West District Cross Country Youth Championships in 1953 and victories in the Senior event in 1961 and 1963. He had a third place in the Scottish Youth Cross Country Championships behind Peter McPartland (Springburn) and after finishing seventh in the SCCU Championships, ran for Scotland in the 1961 international cross country championships. There are many tales of runners who have mishaps with two wheels – Mike Ryan had a motor bike that broke down on the way to the Ben Nevis, George White got a lift through to the start of his leg of the E-G on a motor bike that then knocked him down while he was running and Ian also had his tale of two wheels. Team mate Tommy Cochrane tells of the time when he insisted on travelling through to the 1959 Edinburgh – Glasgow on his motor scooter. He fell off it in the outskirts of Edinburgh on his way to the start of the second stage at Maybury Cross. It is safe to say he ran a bit below par that day! A track runner early in his career – middle distance races including the steeplechase – the question is why did he take up marathon running? One answer was in Alex Cameron’s column in the ‘Daily Record’ after he won the Gourock 14 mile road race in 1960: “Twenty five year old Harris said: ‘I got fed up waiting for the mile at meetings. It is always last and sometimes I was soaked before I even got started. In this race you’re running for a good bit of time. Next year I mean to go on to the marathon, this is only a build up for me'” Well, that’s Alex Cameron but when I spoke to Ian he gave a lot of the credit to Tom Scott (of the Tom Scott Road Race). At the New Cumnock Highland Games Tom was warming up for the road race and he remarked to Ian (who was getting ready for the mile to be held later at the meeting) that since he was training hard he should have a go at the marathon. He was also encouraged by John Kerr who won the championship in 1963. He also took part in a few hill races – he ran the Ben Nevis twice, Goatfell and Ben Lomond. In the Goatfell he was second to Ian Donald by only seven seconds and then the following week he was second in the Ben Lomond race – again by seven seconds! As was said above Ian started his road running career in the Gourock 14 Miles Road Race in 1960 immediately after an all night shift in his job as a baker. “Ian is a baker to trade. Only the night before the Round-the-Cloch race he was on shift work. When he came off duty Ian should have gone to bed. Instead he decided to stay awake. Few people at the Games realised Ian was running under such a self imposed handicap.” He won the race and it was after that that he was written up as a future marathon runner. There was a group of very good and competitive road runners in Scotland at the time and his main rival was probably Gordon Eadie of Cambuslang who was second in the SAAA Marathon Championship in 1959 and winner in 1960. True to his word Ian started running on the roads seriously in 1961. In the 1961 season he had a series of very good runs that had made him favourite for the SAAA Marathon. The year had started with a win in the local Beith New Year’s Day race where he beat Charlie Meldrum of St Modan’s and he went on to have a very good cross country season that led to him being selected to run for Scotland in the International Cross Country Championships. The first race of the summer was the Scottish Marathon Club 10 Miles Track Race at Seedhill Park in Paisley. It was a very close race with Ian finishing fourth in 54:42 behind the man who was to be one of his closest rivals, Gordon Eadie of Cambuslang Harriers, who won in 52:49, George Govan and Bob Wotherspoon both Shettleston Harriers in 54:18 and 54:34. Next came the 16+ Miles of the Clydebank to Helensburgh Road Race which Ian won in 1:26:18 from Bobby Calderwood (VPAAC) in 1:27:28 and future marathon champion John Kerr of Airdrie. On 6th May he ran in and won the Falkirk Invitation 12 mile road race in 71:01 from Bobby Calderwood in 71:14 and John Kerr in 73:10. The distance was stepped up a bit on 13th May when he was third in the Edinburgh to North Berwick 22.6 miles road race in 2:14:09 – one second behind Jimmy Gibson of Maryhill and two minutes behind the winner, Terry Rooke of Middlesbrough. The history of the Scottish Marathon Championships refers to Ian with “who ran well in hill races” and there is truth in it but it was not apparent on 3rd June when he was eighth in the Goatfell Race (2866 feet) in a poor 1:35:30. A week later saw the SMC 12 Mile Road Race in Springburn and he was fourth again – this time behind John Kerr, Willie McBrinn and Jim Garvey of St Modan’s. He started in the Babcock & Wilcox 14 Mile Road Race on 17th June and was forced to drop out. The start of the 1961 marathon at Falkirk. 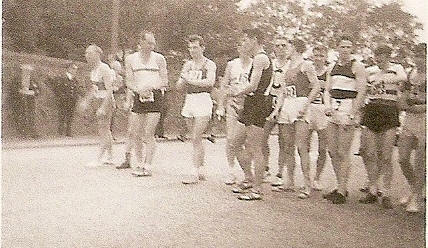 Ian is number 7, also in the picture are John Kerr, the winner, third from the left in white shorts, Willie McBrinn, second, walking across from left to right in all black and David Bowman, Clydesdale, among others. The SAAA Marathon was held on 24th June and although ‘A Hardy Race’ by Clyne and Youngson reported that he was favourite all was clearly not well with Ian. There had been three poor races – Goatfell, Springburn and Babcock’s did not augur well. John Kerr won from Willie McBrinn and in 2:36:06 over a difficult trail from Falkirk to Edinburgh with ten runners dropping out including Jimmy Garvey, Terry Rooke – and Ian Harris. He completed the season with a second place to John Kerr in the Gourock Highland Games 14 Mile Road Race. The season had started so well ended in anti-climax. Summer 1962 was not a good one. After two races he disappeared off the Scottish Marathon Club radar and did not enter the SAAA Marathon. And no wonder – he was by now in the Army and after a six month training he had joined the Paras and spent some time in Bahrein where he trained very hard. The Para training is notoriously tough. I know that when I was doing National Service some of the others fancied themselves as hard men and applied for the transfer to the paratroops but they were all returned to the unit. They didn’t have what it took. Ian came back from Bahrein very fit early in 1963 and it showed in his summer season. Alder says in his biography ‘Marathon and Chips’: “There were several gradual but long uphill stretches on the way out … then the truth dawned! I had a similar terrain to negotiate on the way home.” Well, the reasonable man might ask, why didn’t he tailor his pace on the return journey accordingly? The truth is that the marathon does funny things to your head (runners wanting to hit specific times at check points often write them on their hand or on a piece of paper pinned inside their shorts because thinking gets hard when you are out there), add the heat and the attitude at the time to drinking on the run, add the hills and add his inexperience and it would seem that there’s your reasons. However Ian was also running his first marathon and he maybe did run it too cautiously early on but that was the better way to make a marathon debut in any conditions, in the prevailing weather on the day it was much better. Proof? The difference in the finishing time – all six and a half minutes of it – was built up over the final three miles or so. Ian’s own memories of the race are the long hills and then being told that Alder was walking and when he caught him he ‘strolled’ past him. After a break his season restarted on 3rd August with the 20 Mile Road Race at the Strathallan Meeting when he was third. The winner was Norman Ross of Edinburgh Southern in 1:51:18, Gordon Eadie was second in 1:52:32 and Ian was third in 1:56:07. The first three had run together until the 15 mile point before Ross and Eadie surged away. On 10th August he won the Aberfeldy 13 miler in 1:13:55 from Charlie McAlinden who would go on to win the SAAA Marathon in 1966. The season ended with a remarkable run in the Ben Nevis Race when he was first Scotsman to finish when he crossed the finishing line in third place with Gordon Eadie one place behind. There were only three Scots in the first fifteen, and six in the first 30. The usual strong English contingent was there as was a large contingent from the Gurkhas. Ian led the 1st Battalion of the Parachute Regiment to the first team award. Ian, on the right, in his Army vest. So what kind of training was he doing at the time? Total mileage was about 120 miles a week, often more. He would run the seven and a half miles to the barracks, do some training in the afternoon and then run back at the end of the day. On a Sunday it was a long 15 to 20 miles run on his own and the week included plenty of fartlek. he reckons that the country around Aldershot where he was based was very good for that type of session. Again we have a marathon champion who is putting in many miles, doing speed training with a longer run at the weekend. He must have been very talented but the volume of work speaks for itself. Incidentally he is not in favour of runners training with their ipod or earphones on: your mind should be on what you are doing and where you are running. In 1964 he also won the Inter Services Marathon Championship and kept on running thereafter with racing almost weekly against the RAF and other Units. The Paras team won the Army Cross Country Championships for nine consecutive years with Ian as a member of a very good squad. He ended his serious running and racing career at the age of 36 but competed as a super vet in Germany where he did some running and racing again at the age of 47 for another five years and ran a 25K in a fast 1:30. And when I spoke to him in May 2010 and asked what race had given him most pleasure he said that it had been winning the Beith New Year’s Day Race back in the early 1960’s.